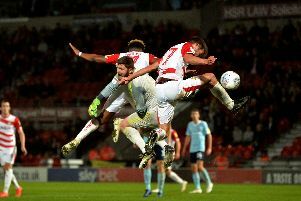 The Doncaster Free Press has teamed up with Doncaster Rovers to offer you the chance to vote for the club’s 2014/15 official Player of the Year. To register your vote, tweet your selection using the hashtag #roverspoty or comment on Facebook, underneath this story. You can also email your choice to sport@doncastertoday.co.uk or cut out the relevant section in today’s Free Press and send it to Sportsdesk, Doncaster Free Press, 39 Printing Office Street, Doncaster, DN1 1TP. The deadline for votes is 5pm, Tuesday, April 21. The winner will be announced at Rovers’ Player of the Year Awards Dinner, which will take place on the evening of Sunday, May 3. Tables of 10 are available, including a three-course meal, entertainment and disco, from £500 + vat. For more information email commercial@doncasterroversfc.co.uk or call 01302 764665.